Shore Access - #104 - Whippoorwill Whip.Poor.Will Cottage is a rustic, romantic step back into the bucolic era of rural America. Located on the far eastern tip of the Island, eight miles form the ferry dock, the cottage flourishes in a prarie setting of over 15 acres and borders another 30 acres of Nature Conservancy. Whip.Poor.Will Cottage is a rustic, romantic step back into the bucolic era of rural America. Located on the far eastern tip of the Island, eight miles from the ferry dock, the cottage flourishes in a prairie setting of over 15 acres and borders another 42 acres of adjacent Nature Conservancy. A walk to the lake is a mere 5 minutes through the beauty of the Conservancy or a 10 minute walk down Old Camp Road, one of the few remaining gravel roads on the Island. 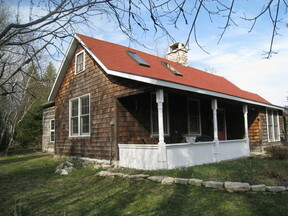 The cottage itself is an architectural delight with a lovely balance of aged timbers and cedar. 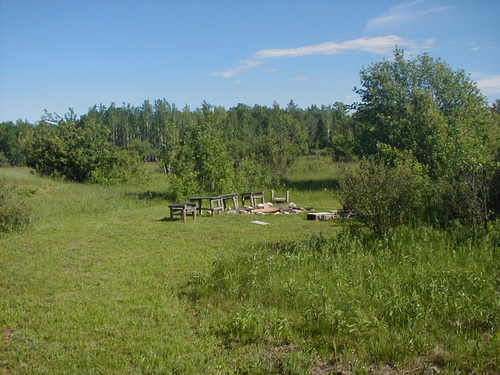 There is a sitting porch for watching the bluebirds and hummingbirds as they feast on the nectar of the prairie flowers. Once inside, the two story front living room has a huge stone fireplace and wide pine plank floorboards. A real oriental rug softens your footsteps. Around the corner, past the modern but quaint kitchen and breakfast nook, and through a set of glass french doors, is another living room, another fireplace, this one propane, a beautiful cherry dining table for eight and access to an outdoor stone terrace; a great place for sunbathing, reading, conversation and grilling. Add to these charms four private bedrooms, two baths and a laundry and you have the rest of this airy retreat. Did I mention the workout room? Probably should not as I think you have already concluded the Whip.Poor.Will is really an oasis for those that want to take a week or two away from reality.